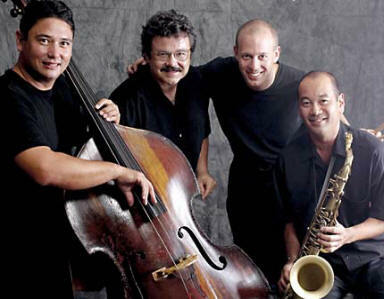 The Honolulu Jazz Quartet is a logical progression in the great tradition of jazz in Hawaii. The band was founded in 2001 by local bassist John Kolivas with the intent of bringing four like-minded musicians together to create a consistent, indelible sound. There are many fine jazz artists in Hawaii, but the economics of making a living as a jazz musician in the 50th State are not conducive to the same group of players working together for an extended period of time. The four members of HJQ have done just that, and the result is a beautiful blend of four individual voices into one distinctive and original voice – a voice that has thrilled audiences at the 10th Annual Hawaii International Jazz Festival, the Honolulu Symphony Pops (with full symphony arrangements), and the finest jazz settings throughout Hawaii. HJQ performances have received praise from top musicians including Rufus Reid, Glenn Moore, Ricky Lawson, Paul Jackson Jr., and James Ingram. HJQ’s debut CD Sounds Of The City was released in Hawaii in September 2003, and nationally on February 16, 2004 under its own label (HJQ Records 2039). The CD made its debut on the National Jazz Radio top 50 Chart (JazzWeek) in March 2004 and has garnered accolades from music critics, musicians, jazz fans, and jazz disc jockeys throughout the world.